OK, I've been a bad blogger. I've been gallivanting in the most unlikely places in Nevada for an upcoming NYT piece, so forgive me as I must attend, occasionally, to the sort of thing that pays the bills. Also, I didn't expect my aircard ot be so slow in bumf***. In fact, I don't quite have any idea why that was the case. 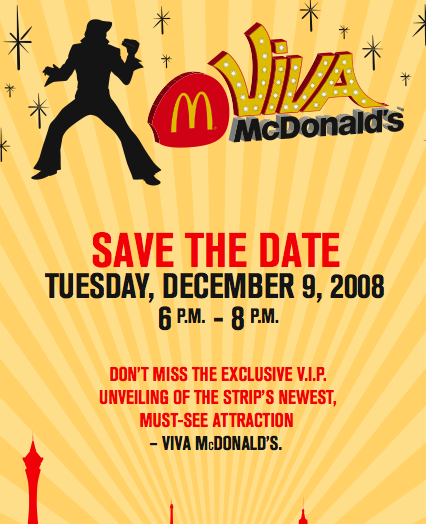 ...upon which the manager has promised some special exclusive McD's video content that will become an event akin to the Bellagio Fountains. Really. He made that analogy. ...but otherwise they didn't really give me much to work with. 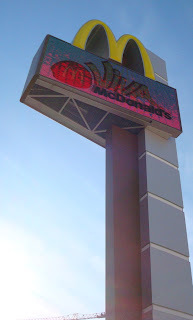 Was it the most expensive McD's ever? No. Largest? No. Busiest? No. 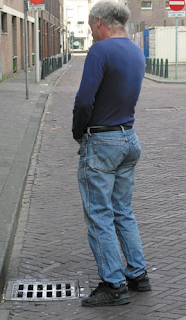 Busiest on the Strip? No. How much did it cost? Can't tell you. OK, then! 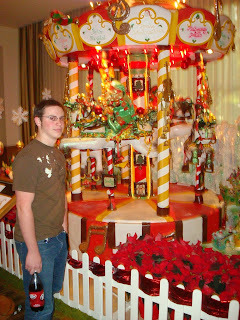 After that, Jamie and I hightailed it to the Four Seasons to check out the annual gingerbread village display that raises money for the Nevada Cancer Institute. They sell each house, starting at $300. That was pretty darned cool. But I don't mean to knock the endeavor. It was well worth the time. I mean, look at this detail! It's open until Dec. 25. Happy Black Friday, everyone! No rest for the weary who hosted 10 people to an awesome meal last night after contributing to this NYT story! 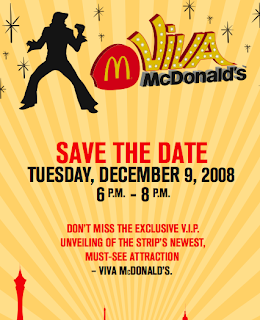 Today I'm off to lunch with a German listener of the show, then to get a preview of the Viva McDonalds because I'll be away for the actual opening and then off to see David Copperfield at the MGM for next week's LVW column. Oh, and my cell phone display is on the fritz, so I'm text-message-less until Monday when AT&T sends me a new one. These are tough times! Hope you're finding great deals out there. Why not listen to us while driving around or decorating the tree! Check it out this show by clicking on the date to hear it or right-click to download the show and listen whenever you want. Or subscribe via iTunes here or via Zune here. We know you’re sick of politics this time of year, but we’re serving it up this week with a distinctive female touch. First, a very rare interview with the first lady of Las Vegas, Elaine Wynn, as she explains her journey from lifelong Republican to Obamatic, much to the dismay of her industry and her husband. You might’ve heard of him. Then, U.S. Rep. Shelley Berkley returns to the program to explain what’s happening with that Internet gambling ban, but what Steve secretly really wanted to know is, has she had any more plastic surgery? In Banter: Criss Angel's follies, is Mel B a superstar, Bye, Danny Gans' billboard, Steve's on (yikes!) Facebook, and no, McCarran Airport is actually NOT the busiest in America on Thanksgiving. 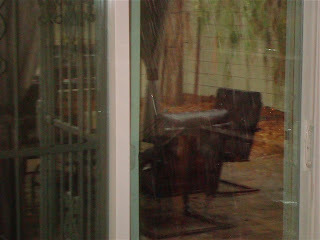 We're having torrential rains here today! Holy crap! But, alas, the show must go on here in Vegas, so I ran out to do some reporting for a NYT T-Day piece and then got back in time to cook up my storm. Folks coming in 90 mins. Ack! Gotta go! Here's this week's column! Time to cook up my T-Day storm! Enjoy and happy holiday! For a split second, if that, a few folks in Nevada mulled an idea proffered in a somewhat offhanded way by an attorney for a slot-machine manufacturer at a gloomy little state-of-the-industry conference. It was an idea so outlandish, so outrageous, so devious and ridiculous and dangerous that within one news cycle even the guy who dared to utter it said he was just asking a darned question and, geez, he wasn’t serious. What horrifying thought could generate such outraged unanimity among a wide range of political bedfellows—Gov. Jim Gibbons and CityLife editor Steve Sebelius agreeing on something?! ?—and such embarrassment that the notion could even be uttered? I’ll tell you. The guy sorta, kinda wondered if maybe a state suffering a budget shortfall that could prompt the termination of school librarians and a halt to cancer treatments at public hospitals would consider expanding the pool of potential gamblers by—oh God, will this laptop keyboard spontaneously combust if I even type such shameful, forbidden words?—lowering the legal age for casino play to 18. To which I ask: Uh, why not? Time To Blow Our Brains Out! I'm not blaming anyone. It's awful out there. But I just had to emit a rueful laugh when I saw this one. Guess what, folks? We're all even more broke than we thought! Read on!!! And now, back into the kitchen I go. Much cooking and preparing to be done! The Strip is LIVE tonight w/ Elaine Wynn! 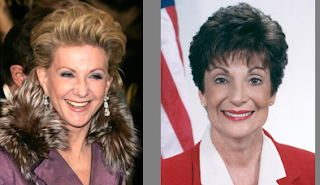 It's political ladies' night on the show this week, with a chat with Elaine Wynn about her political conversion to Barack Obama and U.S. Rep. Shelley Berkley, D-The Strip, on what can be done about the Bush administration's midnight regulations on Internet gambling. Plus, we'll mull the prospective Criss Angel sitcom, the R-J Editor's hatred of the Internet, my forage through Bob Maheu's trash and thoughts on the star power of, uh, Mel B. Also, a new trivia question, your letters and, as always, The Top Secret Tourist Tip of the Week. Join us at LVROCKS.com at from 6:45-8 pm PT tonight for the live show and chat with other listeners. Or wait for the podcast and listen to it over turkey sandwiches later in the week. You decide. Criss Angel To Be Replaced By Ronald McDonald? Well, not yet. But there are signs! 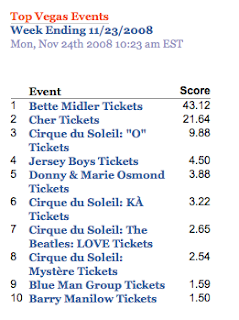 First, despite Criss' forthcoming claim on "Larry King Live," ticket sales for his miserably-reviewed Cirque show at Luxor must be in some sort of free fall if he's not even in the Top 10 anymore on the TicketNews.Com ranking for last week. I mean, he's outranked by the brilliant but 15-year-old Mystere? And this is "based on ticket sales from the TicketNetwork Exchange™, the world's largest secondary market exchange." Ha ha. Unlikely. But if anyone does have a clue what this is, by all means let me know. (I'll be in NY that week and won't be able to attend.) Viva McDonald's? "The Strip's Newest Must-See Attraction?" Oh, the fun we're going to have! Talk about being dragged kicking and screaming into the new millenium! This weekend's Review-Journals offered up several examples of what sort of neanderthal dimwits are running the Bonanza Road asylum. First, there was this very weird column by my good pal Norm, who deserves huge raves and plaudits for his fascinating, lengthy piece about the wayward drug-dealing cowboy who fled the MGM Grand fire in 1980 by climbing down a rope. That was terrific. Read it. His Friday column, however, was an inadvertent scream. It appears he was forced into promoting the big "get" of the R-J's Internet, uh, empire, a folksy weatherman named Nate Tannenbaum who has a hard time keeping his on-air job in the local market. Wroth Norm: "It's the vision of Review-Journal publisher Sherman Frederick, who wants to tap the full potential of the Internet." That's a joke, right? Sherm and "vision" in the same sentence? You're funning us, yeah? But, no. Frederick is quite proud of his dream for the R-J site which is to put Nate Tannenbaum on everybody's smart phones rehashing, no doubt, that day's newspaper or something. Let's review here. The Sun's version of investing in its online properties includes poaching industry visionaries from the Washington Post and Newsweek. The R-J's idea is hiring the castoffs of the local TV business and behaving as though his move into the online space is career innovation rather than career desperation. "This is a whole new world for me," Tannenbaum told Norm. Why? I mean, why him? The Internet's not new. There are lots of smart people in Vegas and elsewhere with years of experience doing that which Sherm has recently developed "visions." Why turn to someone who thinks it's all one great big ol' wacky adventure? Tannenbaum appeals to a much older demo than the folks who would want an R-J newscast on their smart phones. Channel 8, sadly, just shed several excellent people with actual journalistic credentials beyond predicting the weather in a city where the weather never even changes. Why? Oh, I know! What's it that Tweetie Bird sings? Cheep, cheep, cheep. 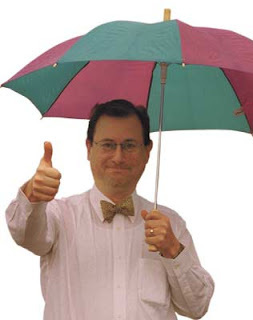 And through it all, Sherm Frederick fancies himself as a genius. Hooray for Sherm! But as silly as this roll out and staffing choice may be, it's still a good idea to expand the video presence, so I hope they succeed with it. Somehow, though, I get the sense that Sherm's underling, Editor Thomas Mitchell, doesn't. He used his Sunday column, for instance, urinated all over the whole newfangled Webby thingie. I, along with several other Review-Journal scriveners, recently joined the lowing herds browsing the ether -- otherwise known as bloggers, those free-range creatures who mostly chew up the intellectual property of others and spit out their cuds online. 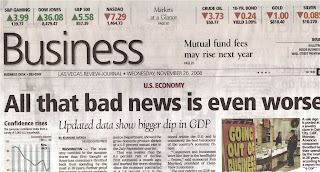 You can find our blogs at the newspaper's Web site, reviewjournal.com, along with some actual news. Yikes, huh? Mitchell seems not to notice that his opinion pages have been filled for decades by people who feed off the reporting work of others and put their interpretations on it. So it's OK for a select few people he personally sanctions to do so, but that's it! Everyone else is a thoughtless, ill-tempered hack. Even if that was all there was to blogging, he's ignored the fact that blogging can be thought-provoking and informative, can give a far longer and robust life to the very articles he publishes, can do what newspapers once held to be their credo, provide voice for the voiceless. Mitchell much prefers those voices to go through him, which is to say he prefers to give voice almost exclusively in Las Vegas to reactionary wingnuts whose views are so extreme, inflexible and venom-laden that they're irrelevant to sensible debate and... HOLY CRAP! Mitchell was an early adapter to the types sometimes found online, if not the medium itself! Mea culpa! What's more, bloggers -- including some at the R-J -- break news all the time. I've done so repeatedly in this space and on the blogs of The New York Times and others when I'm so employed to do so. Even better, I find it far more likely that a print news reporter will fail to provide proper credit for the origin of my work than a fellow blogger and that a print editorial writer won't offer up any source material at all to support his/her arguments. Mitchell also intones, before chewing on the intellectual property of George Orwell and spitting out a worthless cud: "For all of you who write blogs, which seems like everyone, and for all of you who read blogs, which seems like no one..."
That's interesting because Blogger and Wordpress, which power thousands of blogs, are the 12th and 21st most-visited sites in America, according to Alexa.com. The New York Times chimes in at 23rd as the top site for a print news publication. 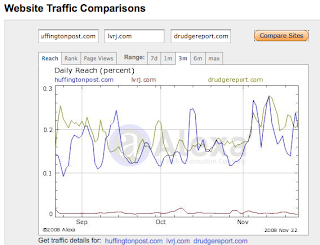 The Huffington Post, the first blog to appear on the list, is 97th. Somebody's reading them. But what's more jarring is the overall purpose of the column: "Hey! We're blogging! We're now in the cesspool! Like you! Come visit us!" ...is just ugly. TinyUrl.Com. Try it.